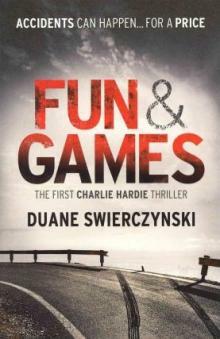 "Duane Swierczynski puts the rest of the crime-writing world on notice. So learn to spell the name. He’s going to be around for a while." "Duane Swierczynski is one of the best thriller writers in America." Hollywood has its own way of dealing with trouble. Get rid of it. Call in the Accident Group – people who can smooth over any difficulty that the ‘beautiful people’ get themselves into. Lane Madden has a past that means she is going to be one of those things that gets smoothed over. Her death on the Pacific Coast Highway was supposed to be choreographed into banality. It was Mann’s show, she would run it. Malibu would set up the accident. O'Neal was intent on finishing it. But it took a bigger crew to put it all to bed. Ex-Cop, Charles Hardie was in the wrong place at the wrong time. House sitting should have been a breeze. Not so. Bad enough that he gets caught up in the life of a fading Hollywood actress at all. Leaping from one tough spot to another – Charlie’s on a never-ending journey dealing with determined murderous attempts on his and Lane’s life. Mayhem doesn’t even begin to describe it. Unbelievable! He needs all his wit, strength and courage to stand a chance against them. And who can say that it’s ever over? Charles Hardie travels light. He’s become a professional house-sitter. Gets well paid for enjoying other peoples homes while they are away. Takes his fill of old films, DVDs and… bourbon. This one hasn’t got off to a good start. Courtesy of the airline, his luggage has gone AWOL. The house is in the back of beyond, well past the sign on the hill that tells you this is Hollywood; well past most signs of normal civilisation – that’s if there is such a thing in Los Angeles. The real snag is at journeys end. The key that is supposed to be waiting for him in the mailbox, well it just ain’t there. With his client away for a whole month, Charlie doesn't have a choice. Looking for some way in, he clambers over the roof. That gives him first sight of his strikingly attractive and completely naked female neighbour. Someone he was going to get much closer to than he could ever have imagined, although she seemed to have absolutely no interest in his attempted 'breaking and entering'. It’s a great house to be in. He’s not the only person who thinks so. Someone else has beaten him to it and, unlike him, they must have come through the front door. Now, as he checks over the music studio, they come out screeching, holding a mic stand like a medieval lance, charging at him. The lady is scared out of her wits, convinced Hardie is one of those who are out to get her and she is going to get him first. And they are after her… though Charlie Hardie takes some persuading. Loss of mobile signal, power to the house cut, his car driven off – yup, those could be just the sort of signs he needs to be convinced. The two of them are in serious danger and about to be under attack – these professional killers insist on no evidence being left behind and a credible narrative to explain the deaths. 'They' have every resource they need, only Mann is running out of time. The simple job of taking out a movie star has snarled up. Every device, every tricky move and Hardie survives it all. Resilient, resourceful beyond belief, he finds a way out for the two of them every time. ‘They’ are not impressed. They should have been ‘cos he’s not finished by a long way. He has lots of options. Call in a friend to help, escape from police custody, steal a car. Why would he chose just one? The gunslinger whose brought in shoots a few bodies… keeping Hardie's head down is one way for Mann to end it. But does it really ever end?